Well, apart from sounding like the answer to a Jeopardy clue that Alex Trebek might spring on unsuspecting contestants, it’s a botanical term to describe a phenomenon that occurs when a normally deciduous hardwood tree stubbornly retains its dead leaves through winter. It is a fairly obscure word and not exactly something that pops up in everyday horticultural chit chat – and one that even puzzles Miss Google who lives in that little hockey puck-sized contraption on the side of my desk. However, the word might get a little more use this season because, if you have taken a stroll around the neighbourhood lately, you may have noticed an unusually large number of trees and shrubs that have failed to drop their leaves on schedule. A young oak in the Glen Stewart Ravine affected by marcescence. Most of those affected are younger marginally hardy trees, including my dependable Japanese maples that still continue to hold onto a full head of dried crinkly foliage instead of being the bare twiggy skeletons they usually are at this time of year. It’s not the first time the two of them have held onto their leaves for extended periods, but this year is different, and the effect is so dramatic that it almost looks as if they are still growing. 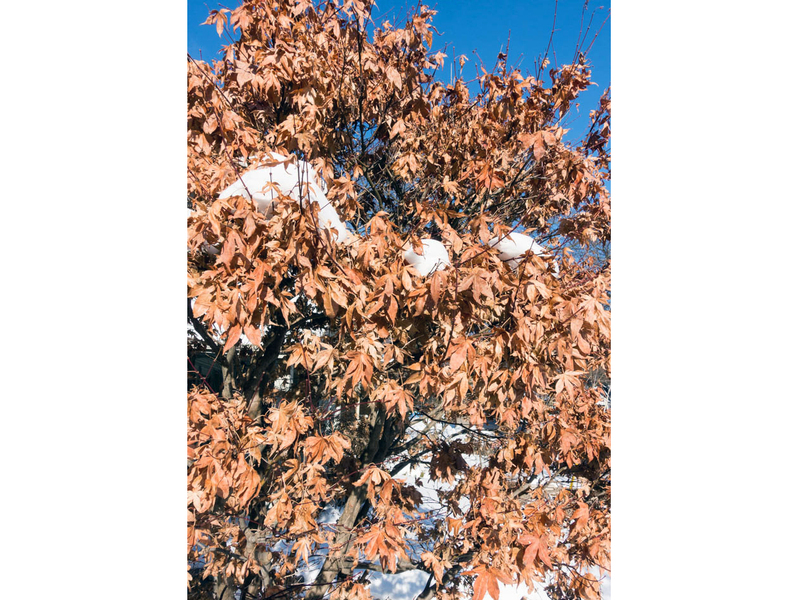 So, what causes marcescence and why do some trees retain their leaves longer than others in the fall and winter? Deciduous trees and shrubs use a combination of lowering light levels and increasingly cooler temperatures as cues to begin shedding leaves in preparation for winter hibernation. Activity in the plants two main nutrient vessels – known as the phloem and xylem – gradually slows and the cells between the leaf petiole and twig form a callous-like membrane called an abscission layer which causes the foliage to fall. If these cells fail to develop normally the tree will become marcescent, and its dried dead leaves will remain firmly attached to the branches. There are a number of environmental and cultural practices that are thought to cause this unique condition. Trees that were over fertilized late in the season, have experienced extreme drought, or are planted in poor soil are all factors that can affect the circulatory system and hormonal balance responsible for the formation of the abscission layer. But the most likely cause of the unusual marcescence we are seeing in this winter can probably be attributed to abnormal temperature fluctuations at the end of 2017. A record breaking 33 degree heat in the first week of fall combined with a relatively balmy October and November which was quickly followed by a bone-numbing freeze in the last week of December probably confused deciduous trees as much as it did the rest of us. Of course some plants are famously marcescent no matter what Mother Nature throws at them. American beech are well-known for holding onto most of their dried golden foliage until spring which makes them great trees for winter interest but causes quite a mess in late May when the leaves finally do drop. 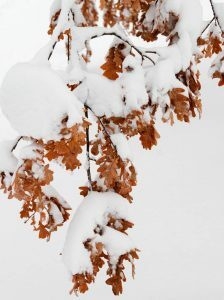 Some younger oak specimens are also known to retain a large number of leaves on their lower branches which will stay attached throughout the winter months especially if they are located in a sheltered spot and protected from high winds. Despite the unusual and sometimes bizarre appearance of trees experiencing a period of marcescence, the overall health effects of the condition are not usually a cause for concern. There may be a greater amount of spring dieback of younger branches when they wake from seasonal dormancy, but most leaves will eventually fall naturally as they are pushed off by emerging buds or blown by wind. And although my pair of Japanese maples still look a little odd covered in February foliage, they do seem to be finally coming to their senses. Late last month, they both started dropping a handful of leaves a day, so with any luck they will be leafless and ready for a fresh crop of greenery by spring.